Description: A very unusual offering from a publisher best known for its series of trashy romantic novels! 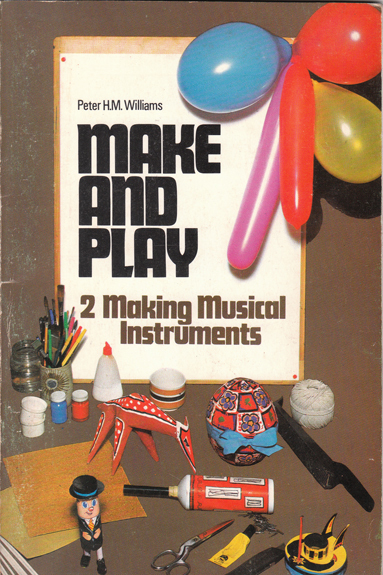 This rare book – #2 in the Make and Play series – provides step-by-step instructions for making simple instruments out of common household items (e.g. washing up liquid bottles, tins, cardboard tubes, &c.). Instruments include a tambour, maracas, pan pipes, and even a zither! Illustrated throughout with nostalgic b&w drawings. Covers edges rubbed. Grubby mark on edge of 3 pages, else all other pages are as new: crisp, clean, and free from foxing or tanning. Measures 19.5 cm × 13 cm (7.8″ × 5.2″). Large 12mo. 48 pp.